Assorted colors and designs. No two are ever alike. Unisex - for both Men and Women! 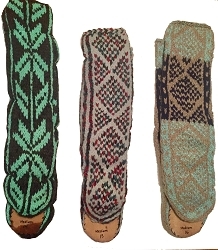 Really warm handmade knitted MUKLUK SOCKS with suede leather soles. Great to keep EVERYONE'S feet warm on cold winter days. Especially great for the elderly because their feet are always cold! The thin suede leather soles help prevent slipping on bare floors. GREAT FOR DANCERS! Mukluk socks fit easily over POINTE SHOES so they are great to wear as POINTE SHOE SLIPPERS to keep a dancer's feet warm when they are not dancing. The dancer in your life will love them! PLEASE BE SURE TO MEASURE THE BOTTOM OF YOUR FOOT BEFORE PLACING YOUR ORDER! 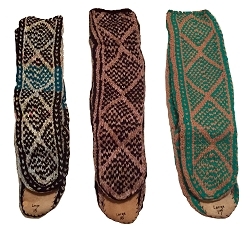 Since these mukluks are for both men and women, using your real shoe size may NOT always work when selecting a size. Please measure the length of your foot by placing a ruler or measuring tape on the floor, line your heal up with the end and put all of your weight on that foot. Record the measurement and then select the size mukluk you will need by referring to the "Length of the Suede Sole" information listed below for each size. X-Small - suede leather sole measures 8 3/4"
Small (Women's size 5-7 or Men's size 5) - suede leather sole measures 9"
Medium (Women's size 8-9 or Men's size 6-7) - suede leather sole measures 10"
Large (Women's size 10-12 or Men's size 8-11) - suede leather sole measure 10 1/2"
X-Large (Women's size 12-14 or Men's size 12-14) - suede leather sole measure 11"
If the measurement of the bottom of your foot is exactly the length or falls between two different lengths given for the length of the "suede leather sole" listed, order the next SMALLER size because the top knitted area will stretch to fit your foot. You DO NOT want the sole to be the same size as your foot or longer than your foot. You are better off ordering a sole size that is A BIT SMALLER than your actual foot length. Having the leather sole the exact length or longer than your actual foot size (even a little bit!) can create a tripping hazard. PLEASE REMEMBER ~ These mukluks are HANDMADE. They are a good quality item but are not made to be perfect, they are completely made by human hands. If you are looking for a perfect, mass produced item, these mukluks are not what you are looking for. Small imperfections are to be expected and only add to the character and charm of these mukluks. In many spiritual traditions, artists deliberately leave a mistake in a handmade object to signify that they know that they cannot make perfection; only God is perfect. As the Native Americans believe, only the Great Spirit is perfect and they intentionally make their items less than perfect (not defective in anyway!) to honor the Great Spirit. Most creators of handmade items follow this belief. For example: If your foot measures 9 1/2", order a small size (9") not a medium size (10"). If your foot measures 9", order an X-Small (8 3/4") not a Small (9"). 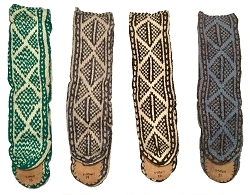 All Mukluks are made by hand and do vary slightly in the length of the sole. IF YOU ARE HAVING A HARD TIME DECIDING WHAT SIZE YOU WILL NEED, SIMPLY SEND US A MESSAGE PROVIDING US WITH THE LENGTH OF YOUR FOOT, AND WE WILL LET YOU KNOW WHICH SIZE TO ORDER. You may also call (856) 316-8602 to get live help in picking a size. Handmade. Imported. Assorted colors. 70% wool and 30% rayon, machine washable. They wash well in the washing machine. Just put them in a lingerie (net) bag and wash them on gentle cycle or hand wash them. It is probably best to hang dry them, but my husband has thrown ours in the dryer a few times by mistake and they were fine. These are not MUK LUK brand or Mukluk boots. 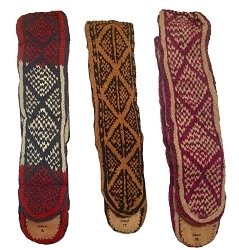 They are mukluk style knitted socks that are very warm and comfortable. Everybody loves them!